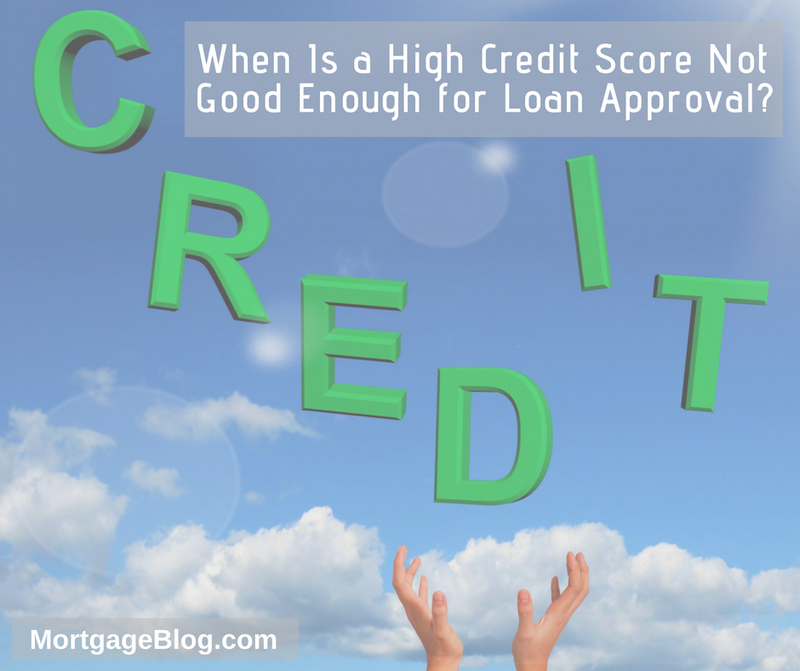 When Is a High Credit Score Not Good Enough for Loan Approval? It’s true that having a high credit score is a benefit when applying for a mortgage. A high score is your ticket to the lowest rates available at the time you apply for a mortgage, especially if you’re applying for a jumbo mortgage (above the high balance conforming loan limits in your area). But don’t let this fact fill you with a false sense of confidence, because your high score won’t guarantee you’ll be approved for a loan. I hear this common misconception regularly from potential borrowers — and not just first-time home buyers. Read on to learn about what other key ingredients need to go along with your high score before you’re approvable. These can only be assessed if they exist in the first place — and ideally, that means you’ve had a few different types of credit for at least 12-24 months. Whether its a credit card, car loan, or student loan, when you make regular payments, as agreed (the terms the creditor gave as a condition of granting the credit), you’re developing a history of managing credit as well as a good score. To understand this critical part of the lending decision, imagine you own a fast, high performing, expensive sports car and your newly licensed sixteen-year-old wants to use it for a date. How do you know if they can handle your fast car, driving it how and where they promise? If they only had more driving experience — and any experience with sports cars – you might risk letting them drive it. A simple analogy to describe the decision that lenders face when someone has no credit history. Before they take the risk of giving a substantial sum of money to someone who is promising to pay it back regularly, they need to see proof of your experience doing this. If they can assess the way you manage debt, documented on your credit report, it goes a long way to helping them justify the risk. Getting approval for a mortgage depends on your ability to demonstrate to the lender that you can handle the responsibility. If you’re starting to build credit, or have paid cash for the more significant purchases in your life, you can use ‘alternative credit’ to document your creditworthiness. A twelve-month history of paying rent, utilities, and a cell phone are examples of acceptable alternatives when you are applying for an FHA loan or a conforming loan. The stakes are higher for the lender with jumbo loans, making the credit requirements more strict. A minimum of 3 tradelines (a credit card, installment loan or mortgage loan, for example) is required that show at least a two-year history, although they don’t have to be currently open. Adding yourself to another person’s credit account as an authorized user won’t help, because the ultimate financial responsibility for those accounts is with the person who added you. Even if you’ve taken the time to steadily build a credit history, diligently paying on time or paying loans off ahead of schedule, you’re still not assured of loan approval. One red flag lenders look for is the rapid accumulation of debt. That means someone opens multiple credit lines (e.g., credit cards, auto loans, student loans) in a short time frame, and uses a significant amount of the available credit on their credit cards. Even a history of several months of payments won’t offset this risk. When the amount of debt you owe increases in a short time, and you’re applying for a mortgage that will add to your monthly obligations – lenders are wary. They wonder how you can be sure you have the income to make all your new payments plus the mortgage payment because they’re not sure you can do it. They’ll look at your job stability and income, along with your savings history, to see if you can manage it all. And most important to lenders is the length of time you’ve been handling all the monthly payments while continuing to save. Demonstrate you can do this using under 15% of your gross monthly income and you may get approved. The easiest way around this is to start with a cash secured credit card. Once you’ve used the credit card over a period of six months, you can expand to an auto loan or another cash secured card. After 18-24 months, you’ll have an acceptable credit history and can apply for regular credit cards. If you’ve made it a practice to pay cash and not rely on debt, a decades-old ideal for sound money management, you’ll have no documentable credit history. While lenders will pay close attention to your saving and investing habits in the absence of debt payments, they’ll still need to see proof of your ability to manage credit to approve your loan request. You can stick with a conforming or FHA loan and use alternative credit, or begin the process of establishing credit with secured credit cards. It’s important to note that having a credit history does not mean you need to carry debt. A credit history can be built by regularly using small amounts of debt paid off entirely in short amounts of time to document a history of credit management. Getting a car loan and making payments for six to twelve months, then paying the balance in full, will also produce a credit history. Demonstrating you can manage debt is more important than your score if you want to get approved.